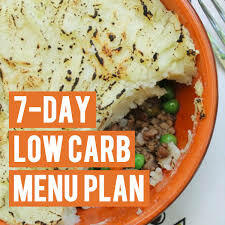 If you have been exercising regularly and have been eating healthy but have not lost weight, perhaps it’s time you tried a low carb diet plan. This is a diet plan which has been scientifically proven to help with weight loss. So to help you out with the diet, here is a sample menu you can follow for a week, and notice the results. The menu provides for less than 50 grams of total carbs in a day. However if you are a naturally healthy and active person, you can afford to consume more carbs than that. Start the day with a breakfast of an omelet with vegetables. Fry the omelet in butter or coconut oil. Lunch can be some grass-fed yogurt with blueberries and a fistful of almonds. Dinner is a cheeseburger without a bun which you serve with vegetables and salsa sauce. Make a little more to eat for lunch the next day. Start the day with a breakfast of bacon and eggs. Lunch is yesterday’s burger and veggies. Dinner comprises of salmon with vegetables and butter. Your breakfast for today is eggs and vegetables fried in butter or coconut oil. Shrimp salad with some olive oil makes lunch. Dinner is grilled chicken and vegetables. Today’s breakfast is an omelet with vegetables fried in coconut oil or butter. A smoothie with coconut milk, almonds, berries and protein powder makes today’s lunch. Dinner is steak and veggies. Lunch is chicken salad with olive oil dressing. Dinner is pork chops and vegetables. Breakfast for today is omelet and vegetables. Have a lunch of grass-fed yogurt with a fistful of walnuts, berries and coconut flakes. Dimmer constitutes meatballs with vegetables. Lunch can be a smoothie with some heavy cream, coconut milk, berries and chocolate-flavored protein power. Dinner is grilled chicken wings and some raw spinach. Basically, while on a low-carb diet plan, you should work at including a variety of vegetables to your diet. Don’t worry. Even if your goal is to consume less than 50 grams of carbs per day, you can safely consume lots of veggies and a fruit a day. Then again, if you are a healthy and active person, you can afford to include some tubers like potatoes and sweet potatoes along with some healthier grains like oats and rice to your low-carb diet plan. You needn’t break your diet while eating restaurants. Just work at making your meals low carb diet plan friendly by ordering a meat or fish based meal as the main dish. Then request that all your food is fried in real butter. And instead of bread, rice or potatoes, just ask for extra vegetables. In case you get hungry in between meals, there are some healthy snacks you can eat like full-fat yogurt, baby carrots, a piece of fruit, a handful of nuts, some cheese and meat and last night’s leftovers.